Properties in Evart average 4.8 out of 5 stars. Kick back at this Chippewa lakefront cottage! Property 1: Kick back at this Chippewa lakefront cottage! Secluded Lake Front - Peace & Tranquility! Kayaks/Paddle Boats/Canoes/Fire Ring! Property 3: Secluded Lake Front - Peace & Tranquility! Kayaks/Paddle Boats/Canoes/Fire Ring! A great getaway! Boat available for rent. Private and quiet. A must see! Property 12: A great getaway! Boat available for rent. Private and quiet. A must see! Beach Front Cottage On Family Friendly Pretty Lake. Sunsets, Fishing And Fun! Property 18: Beach Front Cottage On Family Friendly Pretty Lake. Sunsets, Fishing And Fun! Secluded Log Cabin On Our Private Lake! 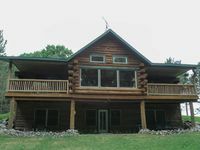 Property 19: Secluded Log Cabin On Our Private Lake! Lovely lakefront log cabin on Eight Point Lake. Relax or have fun in the lake! Property 21: Lovely lakefront log cabin on Eight Point Lake. Relax or have fun in the lake! 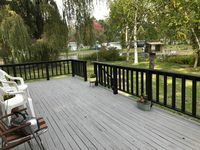 3 Br, Sleeps 10 ~ Cottage On Pretty Lake ~ Great Getaway & Family Vacation! Property 22: 3 Br, Sleeps 10 ~ Cottage On Pretty Lake ~ Great Getaway & Family Vacation! Lavish Tustin Cabin on 7 Acres w/Fire Pit & Porch! Property 28: Lavish Tustin Cabin on 7 Acres w/Fire Pit & Porch! Hilltop Cottage Overlooking Lake W/Extra Bunkhouse And Pet Friendly! Property 32: Hilltop Cottage Overlooking Lake W/Extra Bunkhouse And Pet Friendly! Property 34: NEW Waterfront Lake Cabin w/ Boat Dock & Fire Pit! open year around cabin is great for ,hunting,fishing family reunions. Property 42: open year around cabin is great for ,hunting,fishing family reunions. Michigan Paradise, nestled in northern Michigan wrapped in 20 acres of pines. Property 50: Michigan Paradise, nestled in northern Michigan wrapped in 20 acres of pines. There was plenty of room for our family. The road was a muddy mess just before the cabin but we enjoyed our stay.